An appealing landscape design can add curb appeal and visual interest to your front yard. This is why it’s well worth the time to research landscape design ideas in advance and carefully consider each element you intend to use. If you’re looking for a few simple and sensible front yard landscaping design ideas, you might find these helpful. 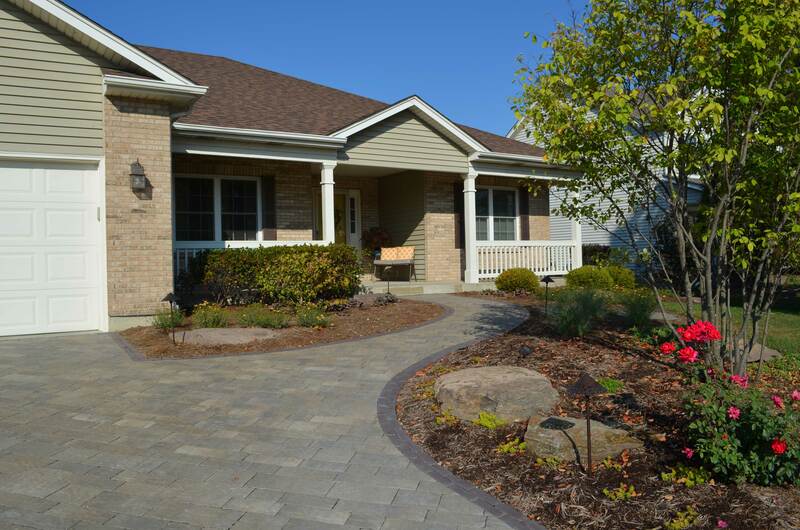 Use pavers to create a walkway that provides a naturally flowing path to your front door while adding visual appeal. If you have plain concrete walks, cover them with brick pavers or slate. Also, keep in mind that loose landscaping materials like wood chips or mulch are fine for use on a backyard garden paths or in areas that are farther away from the house, but they tend to get tracked into the house if used too close to your front walkway. Front yard landscape designs that call for young trees and shrubs can be supplemented with perennial flowers. This will help fill in any gaps until your trees and shrubs mature. Perennials that thrive in DuPage County, such as Coreopsis, Coneflower, and Hosta, can be the ideal plantings to fill in bare spots near young trees and shrubs throughout the course of the first year. Landscape Creations is experienced at selecting the best perennials for these front yard landscaping challenges. Borders and edgings can create attractive outlines in your front yard, as well as provide a dramatic contrast of both texture and color. Consider utilizing flagstones or brick pavers as inner borderwork. Flowers or ground covers can also be used alongside of borders or edgings — just be sure to use plants that will offer an attractive year-round appearance. Add beauty and additional shade to your front yard by carefully situating ornamental or accent trees between the street and your house. Accent trees have a way of making a lasting impression. For example, you may vividly remember a house near your childhood home that had a beautiful flowering dogwood tree in the front yard. Just remember one important tip, use reliable native species that have few issues with pests and that will thrive in the DuPage County area. Raised planting beds add dimension and visual appeal to your front yard landscape. Incorporate dwarf evergreens, flowering shrubs, perennials, or bulbs. When deciding on placement, you’ll want to think about the fact that the soil in a raised bed will dry out quicker than it will on the ground. Be sure to place raised beds in areas of your front yard that receive shade for at least part of the day, and consider installing an irrigation system. Call Landscape Creations at (630) 932-8966 for a free on-site consultation if we can assist you with an updated or new front yard landscape design. Our award-winning design team can help you select the best pavers, materials, and plants that meet your desired landscaping goals. We service Glen Ellyn, Lombard, Wheaton, and the surrounding DuPage County area.